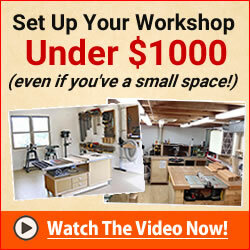 This post will instruct you on how you can build a poker table step by step. The finished poker table is shown in the photograph below. The table is octogonal and has cut outs to hold cards, poker chips and beverage cups. The board is finished with stain and glossy clearcoat varnish; also the playing surface is covered in felt. All materials are cheap and readily available at any builders providers or hardware store. This table could easily be made over a couple of weekends depending on your woodworking experience and using modest woodworking tools. It would make for a very cool addition to any man cave! I got my poker table plans here along with 150 other table plans. Finished Poker Table that you, yes you can make! Firstly, start with your 6'x8" 3/4" thick pine boards. These will be cut into 8 pieces and will form the perimeter of the top surface of the poker table. These will be routered out later to allow space for cups and chips/cards. Next take your 6'x3" 3/4" thick long pine boards and using a drop saw or hand saw (with mitre box! )cut them roughly 1" longer than the longest edge of the 8 pieces that you have just cut in Step 2. These will be nailed and glued along the edge of the table top as a finish molding. The next step will involve nailing and gluing ﻿the pieces cut in step 3 to the pieces cut in step 2. I did mention that the pieces cut in step 3 ought to be about 1" longer than the longest edge of the piece cut in step 2. This difference will be split so that the pieces from step 3 will stick out 1/2" on each side of each piece (longest edge) from step 2. This was to ensure that there is enough material to trim off at the appropriate angle i.e. flush and inline with edges of the pieces made in step 2. Nails out to be punched below the surface and then later filled with appropriate colored wood filler. The next step is to trim up the assembly on both sides such that each edge of the assembly is at the same angle. This is done using the mitre saw. Please ensure that your mitre saw is at the correct angle. Double check to be sure! Run your finger along the cut edge to ensure that the surface is smoothe and the edge of each piece is aligned. The image on the right below shows the desired result. Using a hole saw cut a hole wide enough to allow the cup holders to fit snugly. The next step involves cutting the rectangular hole out which will allow each player to store his/her chips/cards. I did this by drilling a hole within the outline of the rectangle to allow the jigsaw blade to get started then slowly and carefully cutting out the material. Patience is key here, as I would imagine you want a smooth straight finish. Tip: Clamp a piece of straight edge to run your jigsaw against. This will ensure a very straight cut. This isn't shown in the diagram by the way. At this stage, all going well, you should have 8 assemblies exactly like that in the picture above on the right. It would make very good sense at this stage to dry fit the assembly to ensure that all edges join up with no gaps, if you what I mean. They then can joined permanently. Assuming that step 8 went well, the next step will be to cut out holes for the biscuits using the jointer and then gluing up the assembly. The pieces will be held together using clamps in the positions shown on the image on the right below. The final assembly will first be glued and allowed to dry in half. This is shown in the photo below. Once the glue has dried, the two halves are then glued together on the flat as shown below in the picture. 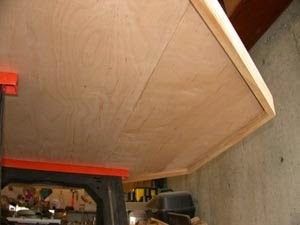 The next step is to cut the plywood base onto which the assembly above will sit. Using the octagon ring made in step 9, measure the inside diameter and this will give you the measurement to mark out the outline of the base onto a sheet of plywood. I actually had to join two plywood sheets together as one would not suffice. It's all about measuring twice and cutting once here! 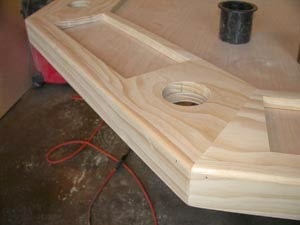 The holes for the cup holders will now be cut out in the plywood base. This is done by fitting the top octagon ring (from step 9) to the plywood base (from step 10) and then using the top holes as a guide for the hole saw to cut holes into the plywood base. To give the table top a nice appearance I rounded all the edges with a router and a rounding bit. Paying particular attention to the joints, I sanded all the surfaces with 120 grit paper on a hand held sander. I finished off the sanding with a 220 grit sandpaper. The surface was very smooth at this stage ready for stain and a finish. But that will come later. Next to cut out the centre octagon. Next, the centre octagon (play surface) is cut out and wrapped up with felt. This piece is cut using a 4' x 4' sheet of 3/4" birch plywood. Remembering that batting & felt will be wrapped around this piece it is important that there roughly a 1/8" gap all around to allow for the thickness of the felt. The batting is glued to the plywood using a spray adhesive. The edges are then wrapped around the edges and stapled to the other side. The same is done when gluing the felt (green) to the batting. 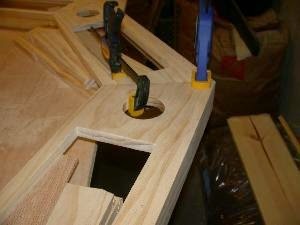 Step 13 - Making the foot of the table. The foot of the table is simply a plywood octagon which can be made to any width you desire. Mine was made 5/6 the width of the octagon centre piece mad in step 13. The pedestal is the base onto which the table top rests. The pedestal consists of an upper pedestal and a lower pedestal. The upper pedestal slides over the bottom pedestal such that the table can be easily dis-assembled and transported from one place to another. The top (&bottom) pedestal is square and is made from 3/4" plywood. The pedestal is nailed and glued together. 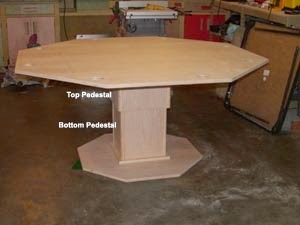 The bottom pedestal is constructed in the same way as the top pedestal but is nailed to the plywood foot. This is shown in the photos below. Both the top and bottom pedestal edges are finished with a pine trim. The next step involves staining all surfaces that will be visible when the table is fully assembled. All surfaces are given a sanding firstly with 120 grit sand paper and then secondly a rub with 220 grit sandpaper. All surfaces and brushed and rub with a tack cloth to remove any dust. Uneven staining is a common problem when staining softwoods like pine, thus the wood is first preconditioned to allow the stain to stain the wood more evenly. The stain is allowed to dry, lightly sanded and rubbed with a tack cloth. The wood is then given a coat of polyurethane. Once the polyurethane has dried you can now proceed to attach the top pedestal to the plywood base. The table is assembled. The octagon ring will give the correct positions for the batting and felt cut outs. The method of securing the batting to the plywood base and then the felt to the batting is identical to the method used in step 13. Once the fabric fitting is complete lay the octagon ring on top. Step 18 - Ready to Play some Poker? The table is ready for some fun nights of poker playing with friends or family. I hoped that you have realised just how easy it is to make your own poker table. I used some plans that I bought online and they were well worth it. I have had many a fun night poker with my buddies, you can too.